BEGINNER FRIENDLY: The Anvil Rock Trail follows a well-graded road along a ridge line out to 3 fantastic lookouts – one taking in the rock itself, the 2nd is Perry’s Lookdown and the 3rd is Pulpit Rock. 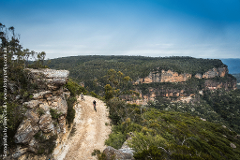 The Great Blue Mountains Trail runs between Katoomba and Blackheath and is a mix of road and purpose built trail. Suitable for everyone. Fantastic tourist route! (Electric E-Bikes available) .With scenic valley views across the Grose Valley and crisp mountain air, this ride follows a rough fire trail along the ridgeline to the spectacular Baltzers Lookout at Hanging Rock. A truly AMAZING ride! Grab a bike and jet off to see all the hot spots of Katoomba and Leura. Cover 35-50km for the day. You cant to that walking! The spectacular Narrow Neck trail follows a ridge-line deep into the valley, offering exhilarating scenic views across the Megalong Valley in the heritage listed Blue Mountains National Park. INTERMEDIATE FITNESS and SKILL or above is best! Hire a Blue Mountain Bike for 3 days and explore the mountains at your own leisure. Take in the trails, the sights or just roll with the good times. 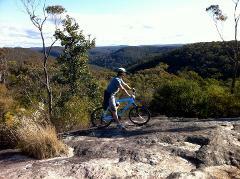 Hire a Blue Mountain Bike for 2 days and explore the mountains at your own leisure. Take in the trails, the sights or just roll with the good times. 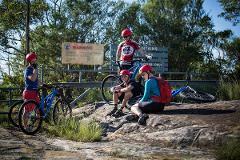 One of the most popular trails in Australia, “The Oaks” Fire trail has all the elements of a great ride and experience. The trail runs between Woodford and Glenbrook. This ride comes with a 1000m vertical decent. Most people can ride this! Treat someone to some real FUN. 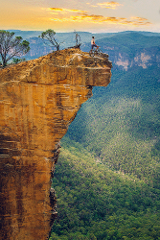 Mountain Bike riding or touring in the Blue Mountains, now that's a UNIQUE gift, so Kudos to you for thinking outside the square! 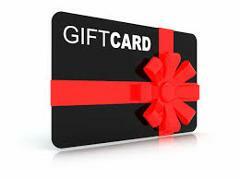 This voucher is for any of the 5hour OFF-ROAD trails we have on offer. Treat someone to some real FUN. Mountain Bike riding or touring in the Blue Mountains, now that's a UNIQUE gift, so Kudos to you for thinking outside the square! This voucher is for the Katoomba to Leura 5hour ROAD-RIDE loop. Hire a Blue Mountain Bike for 5 days and explore the mountains at your own leisure. Take in the trails, the sights or just roll with the good times. With scenic valley views across the Grose Valley and crisp mountain air, this ride follows a rough fire trail along the ridgeline to the spectacular Baltzers Lookout at Hanging Rock. 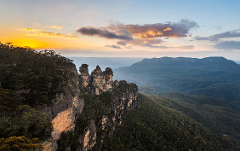 The spectacular Narrow Neck trail follows a ridge-line deep into the valley, offering exhilarating scenic views across the Megalong Valley in the world heritage listed Blue Mountains National Park. INTERMEDIATE FITNESS or above is best! 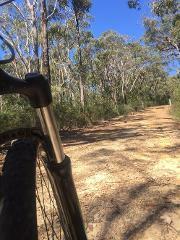 One of the most popular mountain bike tracks in Australia, “The Oaks” Fire trail has all the elements of a great ride and experience. The trail runs between Woodford and Glenbrook. This ride comes with a 1000m vertical decent. Need a Bike for the Max Adventure Race ? Ill deliver bike and helmet to Race HQ and meet with you. E-Bikes will make it possible for EVERYBODY to ride a bike again! This tour is for the recreational rider with limited skills, nature lovers and families. Set in the Glenbrook precinct of the Blue Labyrinth, just 45 mins from Sydney. Hire a Blue Mountain Bike for 7 days and explore the mountains at your own leisure. Take in the trails, the sights or just roll with the good times. Hire a Blue Mountain Bike for 4 days and explore the mountains at your own leisure. Take in the trails, the sights or just roll with the good times.